Discussion in 'Conspiracy Theories' started by newportrojan, Mar 14, 2013. As seen below...Are all these famous people Masons? It's the sign where someone will put their arm in their coat on purpose declaring themselves part of the masonic order...is this debunkable? The hand-in-waistcoat was a gesture commonly found in men's portraiture during the 18th and 19th centuries. Napoleon I of France was most well known for the gesture and is readily associated with this gesture because of the several portraits made by his artist, Jacques-Louis David. Theories state the gesture was done by Napoleon because of a stomach pain he had, but the pose was common in portraits from the mid-18th century. The pose originates from classical times — Aeschines, founder of a rhetoric school, suggested that speaking with an arm outside one's toga was rude. It's just a portrait style, originating from ancient times. Everyone was doing it. A lot of those images from the whale.to page are really drawing a long bow. Some of them don't even have the hidden-hand thing going on (Tom Hanks, Sami Nasri, Leonardo Dicaprio). And of the non-posed photographs, many look, to my eyes, like someone just adjusting their scarf, or patting down their tie, or scratching themselves (Paul McCartney, Mubarak, Colin Powell, Kanye West, Martin Scorcese). There's a at least one 'hand-over-heart' in there as well (Todd Palin). and it just so happens to be the sign used by masons as well? (I'm not arguing you, I want this to be debunked to calm my nerves!). And why would people today continue to pose this way? Same with the 'diamond' sign that just about EVERY celebrity is flashing these days. What gives? If you don't know then why would "they" tell you? the whole purpose of secret signs is, you know....to be secret!! Is it used by the masons? Is there any evidence for this, outside of conspiracy websites? I reckon you could come up with just about any random gesture or pose, and attach a 'secret sign' stigma to it. "He's got his pinky finger in his ear! He must be a mason!" It's not exactly "used" by them. There's a part of one initiation ritual where they put their hand in and take it out again. It's a Biblical reference there. A transfer of meaning from antiquity to the eighteenth century can indeed be described for one such classically derived stance - the familiar male pose with a hand tucked in a waistcoat. This transformation of a postural into a portrait convention occurs at the critical juncture when England was emerging as a national power, engaging in the first of a long series of Continental wars that intensified Anglo-French enmity. (23) In response to France's challenge to her political and religious autonomy, England strengthened her self-image and forged her Augustan appearance. The following discussion tracks the curious route by which an ancient sculptural model was influential in visually defining English character. It is useful to consider first a representative sample of the eighteenth-century "hand-in" type showing English sitters by English painters. A typical cross-section includes a Self-Portrait, 1710, by Godfrey Kneller (formerly at Lowther Castle); Horace Walpole, ca. 1734-35, by Jonathan Richardson, Sr.; William James, 1744, by William Hogarth (Worcester Art Museum, Mass. ); Samuel Richardson, 1750, by Joseph Highmore ]; George Friderick Handel, 1756, by Thomas Hudson; Self-Portrait, ca. 1759, by Thomas Gainsborough; and Sir Hugh Molesworth, ca. 1760, by Reynolds (British private collection). A quick survey of these or any similar compendium of English eighteenth-century portraits immediately reveals that many artists made use of this same basic model. (24) The "hand-in" was one of the most popular of various stock poses portraitists offered their clients, and its prestige was buoyed by the commercial practices of London's major portrait studios. (25) The pose acquired its greatest cachet in the late 1740s and early 1750s as a staple of Thomas Hudson's fashionable studio, where it was considered eminently suited to the taste of "persons of quality and worth" who chose to be painted in a manner deemed "agreeable and without affectation. "(26) Hudson, who used the pose so often that his ability to paint hands was called into question, apparently passed his market experience on to his students, supposedly counseling Reynolds that if he wanted to make a fortune, he must put hands in bosom or waistcoat pocket. (27) The type subsequently filtered down and became a staple of second-string painters of the squirearchy and middle classes such as Arthur Devis, whose "portraits in the small" offer numerous examples of the use of the gesture. (28) By mid-century one could call such works "commonplace" portraits,(29) for, as in the case of the formulaic entries in commonplace books, the authority of the type came from sanctioned usage. In the full compass of its eighteenth-century usage, the hand-in-waistcoat portrait allowed for a number of formal variables: from a half to a full-length format, either seated or standing, the setting either landscape or interior, the figure oriented toward the left or right, and with either the left or the fight hand masked. Commonly, the right hand is inserted, although many examples show the left inserted instead. However, when the figure is depicted holding a hat, the image complies with prevailing social etiquette, which dictated that the hat be in the right hand. When the hat is shown placed under the left arm, either the right or the left hand might be inserted. (30) That these permutations of the form allowed ample latitude for individual characterization is readily seen by comparing Gainsborough's poetic self-portrait with Hudson's dour depiction of Handel. However, it should also be noted that in the broader context of eighteenth-century usage the pose was by no means exclusive to English painters, nor was it reserved for depicting English sitters. It was on occasion employed by the Lombard Ceruti, the Venetian provincial Manzini, the Swiss Liotard, the French pastelliste Perroneau, the Spaniard Goya, the Russian Leviatskii, and by many other Continental painters. But it is the ubiquitous success of the format in England that needs an explanation. It is perhaps ironic that while Hogarth distinguishes the portrait use of the gesture from its social use, it was the French who originally factored the exchange between portraiture and behavior - through the influential medium of engraving. Indeed, we find the earliest depictions of the "hand-in" pose in French prints dating from the early 1680s. It is significant, however, that it is not used in French painted portraits of the period,(35) but is instead confined to a medium meant essentially for reproduction and limited to subjects of a documentary nature. Reserved for concrete, factual descriptions presented without the rhetoric of art,(36) the pose is frequently seen in costume plates, such as those by Henri Bonnart, which announced and officially endorsed what was a la mode at court. (37) Similarly, it appears in engravings that give a candid glimpse of social etiquette at Versailles. In one such plate from the series Les Appartements by Antoine Trouvain, Monsieur, the king's brother, and several courtiers attend Louis XIV at a game of billiards, with their hands discreetly withdrawn ,(38) Clearly, the gesture is part of the language of social decorum; it belongs with the ritual of bows, honors, and formal courtesies set by the French court in the seventeenth century. This precedent suggests that English painters transformed a French social convention into an English portrait convention - and that they more readily absorbed elements from France's prosaic, factual engraving tradition than from her more flamboyant portrait-painting tradition. Nonetheless, this adaptation involved a substantive change. We can see that the process of transformation was already complete by 1738, the year Francois Nivelon published his Book of Genteel Behaviour,(39) a manual offering visual and verbal instruction on how to walk, stand, and present oneself for the minuet. Its engraved illustrations confirm that by that time graceful movements had become rigidly codified into prescriptive, static poses. 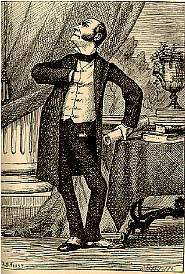 One such pose was the "hand-in-waistcoat" - body language that Nivelon identified as signifying "manly boldness tempered with modesty" . I looked it up, it seems to just be a sign the Jay-Z started and he may have 'stolen' it from someone else. My dad was a Mason, I saw him greet other Masons and they just shook hands, they recognized each other by their Masonic rings. I had a problem with a teacher in HS and my parents came to school to discuss it with the principal, by dad spotted the Principal's Masonic ring and they exchanged which lodge and their 'rank' before the discussion. Former pro wrestler Diamond Dallas Page is suing Jay-Z, claiming the hip-hop heavyweight has illegally adopted his trademark hand gesture — the "Diamond Cutter" — as his own.The suit, filed in Los Angeles Federal Court on Friday, accuses Jay-Z and Roc-A-Fella Records of trademark and copyright infringement as well as misappropriation of the hand symbol. Page is seeking an injunction (meaning Jay-Z would be prohibited from using the gesture) and unspecified monetary damages. Is that in, out, in, out then shake it all about. I would think that actual dress nay gave to do with some poses. Even for a photograph it feels unnatural to just stand with your hands by your sides. You need a pose that will make you look aloof. I have noticed how the UK police have changed their stance over the past few years. Now you will see them constantly with their fingers tucked behind the top of their body armour. I asked a copper about it once and wanted to know if the armour was uncomfortable. He surprised me by saying no. The conversation went on to discuss that the habit was somewhere to out your hands and still look approachable. You change your pose to suit your clothes. Another example is the young lads that walk around with there jeans around their arse. They usually have one hand in their pocket. Apart from holding their jeans up what other reason is there? Apparently, all the kids at school think it is a Illuminatti gang sign. The last week or so, I've been having to explain Illuminatti/Mason CT to my kids. Apparently not everyone. I do not see any underlings daring to do it. No 'imitation is the highest form of flattery' there. NB does anyone think there has been some form of 'photoshop' done on these pics? Why would your nerves be on edge if the Masons make a sign like that? What is the "diamond sign"? Holding ones' hands together touching forefingers and thumbs? That's a "sign". Someday when someone scratches their nose, that's going to be a sign! Before you edited and added the NB, I was going to ask what the deal was with the 2 photos, LOL. Lol. I have never seen that before, but then I am not down with the kids. For a Masonic sign it appears to be lacking in something, subtlety. With reference to Stalin, I am going to have to do some digging but I am certain that I read that he persecuted the Freemasons. Freemasonry does indeed involve a great deal of symbolic stances and signs, and the 'hidden hand' is one of them. Remember when you were a kid in Karate-Class, and every time you advanced a belt, you had to perform a 'kata'? Show off your moves, do a choreographed little 'dance', bow at the start and bow at the end, ect.? Freemasonry has a somewhat similar, if not significantly more gentlemanly and less physically demanding policy toward advancement. Considering there's over 30 levels of advancement in the society, there's plenty of room for handshakes, poses, 'dances', ritual words and hand signs. That'd be why little coded 'cheat-sheet' booklets are employed, so that members can keep up with all the hoopla. If a majority of the figures with portraits in that pose are in fact associated with or members of the Masons, then that's not an unfair line to draw at all. If they aren't, and only a small few of the portraits in that pose are of people associated with the Masons, then perhaps it was just a 'trend'. Either way, this is the sort of thing that's going to be rather difficult to prove. Stalin might have been going for a smoke. 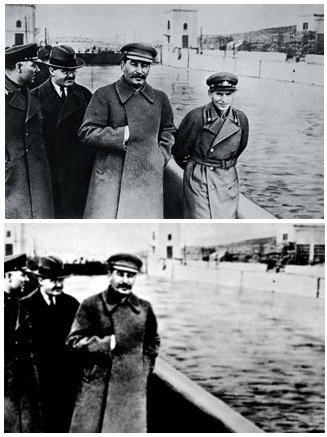 Stalin might have been going for a smoke. Or maybe he wanted to be Napoleonic.